Karolina Protsenko is a 10-year-old girl who found her love in violin playing. She comes from the United States and her musical talent is really something special. She proves this to us all over again with the videos that she publishes on her Youtube channel! 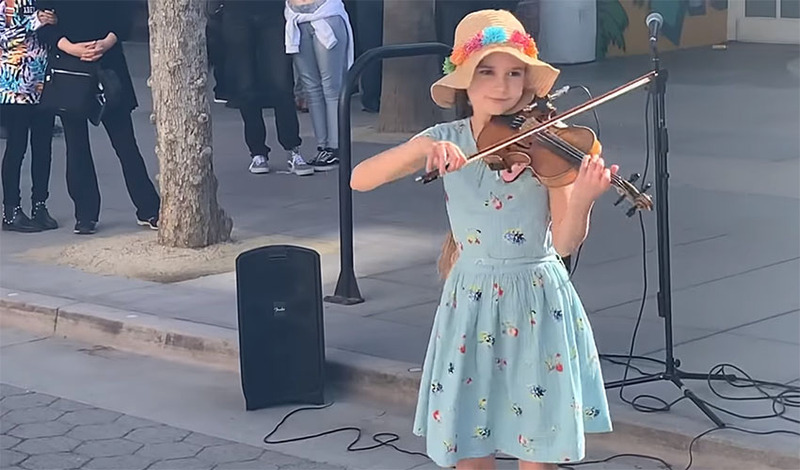 The adorable Karolina began playing the violin wwhen she was 6, and in 2016 she opened her channel on Youtube. With many violin covers of famous song, she took over many people in the past, and to date her channel has more than 240,000 subscribers. These days, 10-year-old Karolina shared another wonderful performance on the web with which she took many breaths away. On one of the streets she played all the famous song "Shallow", which became a hit thanks to the movie "A Star Is Born". The song is originally performed by Lady Gaga along with film actor Bradley Cooper, and the violin performance of the song by Karolina is really something special. Listen to the wonderful performance with which little Karolina impressed many passers-by and a lot of people around the world. Will you also be impressed by her playing?